The PHENIX detector at the Relativistic Heavy Ion Collider (RHIC), a particle accelerator at Brookhaven National Laboratory uniquely capable of measuring how a proton's internal building blocks — quarks and gluons — contribute to its overall intrinsic angular momentum, or "spin." By analyzing the highest-energy proton collisions at the Relativistic Heavy Ion Collider (RHIC), a particle collider at the U.S. Department of Energy's (DOE) Brookhaven National Laboratory, nuclear physicists have gotten a glimpse of how a multitude of gluons that individually carry very little of the protons' overall momentum contribute to the protons' spin. The data described in a recently published paper indicate that these glue-like particles—named for their role in binding the quarks that make up each proton—play a substantial role in determining the intrinsic angular momentum, or spin, of these building blocks of matter. "These results confirm our suspicion that a lot of the gluons' contribution to proton spin comes from the gluons with relatively low momentum," said Ralf Seidl, a physicist from the RIKEN-BNL Research Center (RBRC) and a member of RHIC's PHENIX collaboration, which published these results. The results also suggest that gluons' overall contribution to spin might be even greater than the contribution from quarks. Exploring the sources of proton spin is one of the major scientific missions at RHIC, a DOE Office of Science User Facility and the only machine in the world capable of colliding protons with their spins aligned in a chosen direction. Nuclear physicists from around the globe, including many supported by the Japanese RIKEN laboratory, come to RHIC to study these "polarized proton" collisions in an effort to solve the so-called proton spin puzzle. The RBRC was established at Brookhaven in collaboration with RIKEN to support young scientists engaged in this and other relevant research. 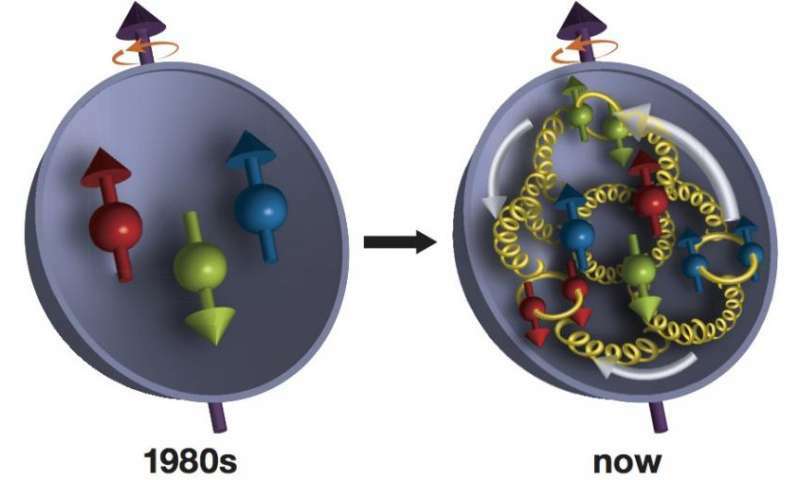 The proton spin mystery originated when experiments in the 1980s revealed that a proton's spin—a property that influences these particles' optical, electrical, and magnetic characteristics—does not come solely from its quarks. To tease out the gluons' role, RHIC physicists collide two beams of protons with their spins aligned in the same direction, and then with the polarization of one beam flipped so the spins are "antialigned." The PHENIX detector measures the number of particles called pions that come out of the collision zone perpendicular to the colliding beams under these two conditions. Any difference observed in the production of these pions between the two conditions is an indication of how much the gluons' spins are aligned with, and therefore contribute to, the spin of the proton. RHIC is the only machine in the world that can collide protons with their spins aligned in a particular direction. 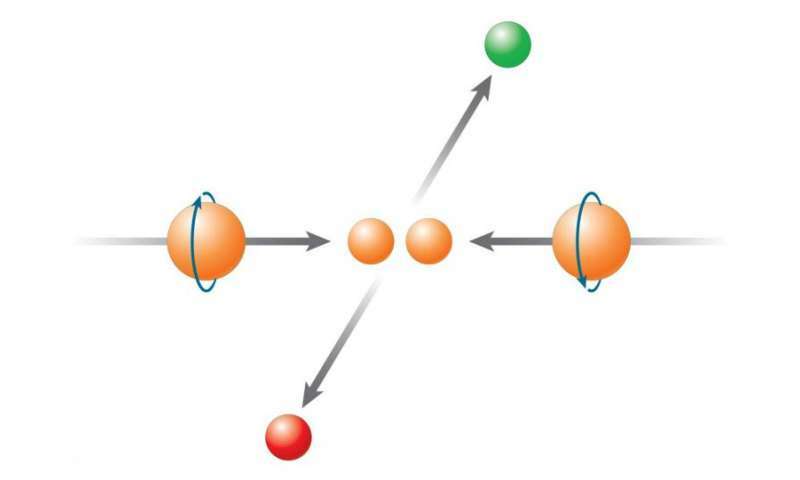 Measuring differences in the particles produced when the spins in the two beams are pointing at one another (as shown) vs. when they are pointing in the same direction, colliding "head" to "tail," can help scientists tease out the contribution made by gluons. Results reported in 2014 indicated that gluons definitely play a significant role, but the uncertainty about the size of their contribution was fairly large. Both the energy of the collisions and the angles at which RHIC's detectors were measuring limited the range of gluons those experiments could explore. The new data come from collisions at a much higher energy—500 billion electron volts (GeV) as compared to the earlier 200 GeV data. 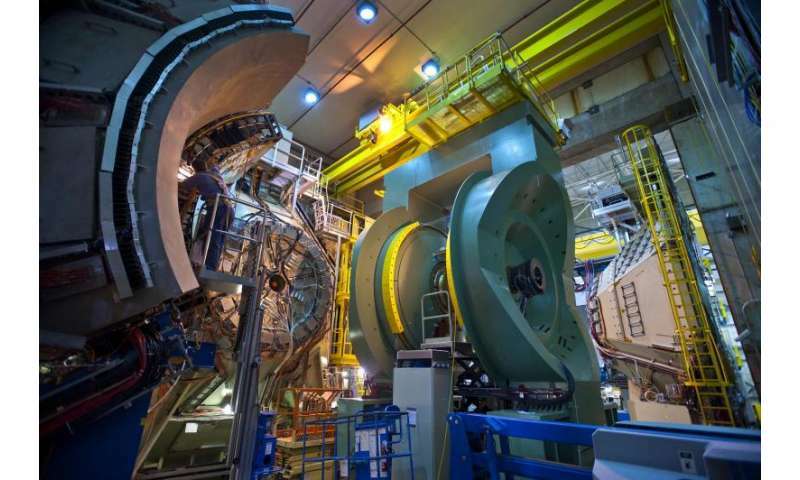 "This higher collision energy allows us to extend the 'kinematic range' to look at the contributions of gluons that carry a lower fraction of the overall momentum of the proton," said Seidl. "It sounds contradictory at first, but as the collision energy goes up, the 'momentum fraction' of the gluons whose contribution you are measuring goes down." You can think of it like a microscope, explained John Lajoie, a PHENIX collaborator from Iowa State University. "Going to higher energy allows you to focus on smaller objects. In this case the smaller object is the lower-momentum-fraction gluons." The data show that these "wimpy" gluons play an outsized role in contributing to proton spin. The reason, the physicists say, is that there are so many of them. "The density of gluons increases very rapidly for very low momentum fractions," Seidl said. Using the microscope analogy again, "the more we zoom in, the more 'quantum fluctuations' we can observe," said Lajoie, referring to the whimsical tendency of subatomic particles to split and transform. "Inside the proton, there's a sea of quarks and antiquarks and gluons changing and evolving. When you look with one resolution you see a certain number, but looking closer you can see that some of these particles have split, so there are actually more gluons there." The measurements of low-momentum-fraction gluon polarization, and these particles' large contribution to overall proton spin, have reduced the uncertainties about the overall size of the gluon contribution to spin somewhat. While the previous results indicated that gluons might contribute about as much as the quarks and antiquarks, the new findings may bring the gluons' total contribution a bit higher. "Large uncertainties remain and there's room for improvement in these measurements," Seidl said. There are also other ways to look for contributions from even lower-momentum-fraction gluons, including exploring particles emerging from collisions at more "forward" angles. "Extending the momentum fraction range even further to lower values is one of the remaining goals of the RHIC spin program," Seidl said. It's also one reason nuclear physicists would like to build an electron ion collider (EIC), a machine that would use an electron beam to probe the internal structure of the proton even more directly. "An EIC would allow us to make numerous, extremely precise measurements across a much wider range of momentum fractions," said Brookhaven physicist Elke Aschenauer, a leader in the spin program at RHIC. "It would be the only facility in the world that could measure the distribution of polarized gluons as a function of their momentum and also their spatial distribution in the proton—like a microscope that resolves even the smallest features very precisely." A recent report from the U.S. Nuclear Science Advisory Committee ranked an EIC as its top priority for new facility construction once another construction project already underway is complete. So scientists may get their wish of being able to see gluons precisely enough to finally resolve the spin mystery. Wow, how stupid are we? Let's just show em a graphic of the inside of a stopwatch running backwards and claim it is a diagram of SA particle motion inside a stable SA particle.